Choosing a block of acetate is not something I’d bet most people have done in their lives. There are parallels with picking a suit from a tiny swatch of wool. 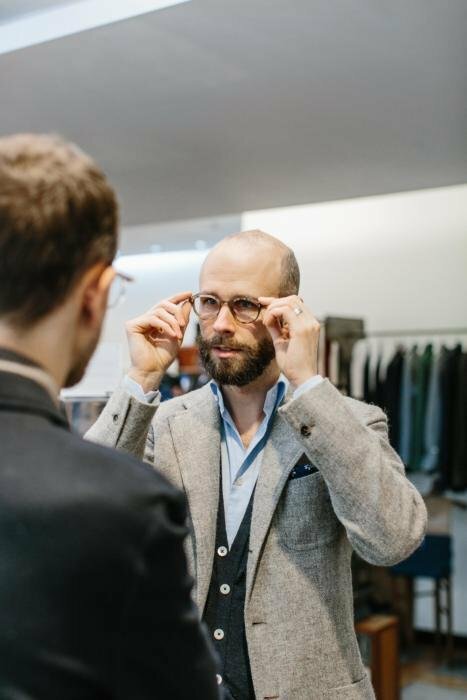 But where with a suit you have to imagine how a pattern will look repeated and enlarged, with glasses you have to do the opposite - consider a piece of solid plastic and imagine what a 2-4mm cut-out will look. I’d argue that it's actually harder than picking cloth. Particularly when glasses inherently have more impact, being so close to your face and probably worn more frequently. I’d also argue that if any suit is in a bold pattern or strong colour, you should try to see it made up before you commission it. The risk is too great, particularly on bespoke. So you should definitely do so with a pair of glasses. 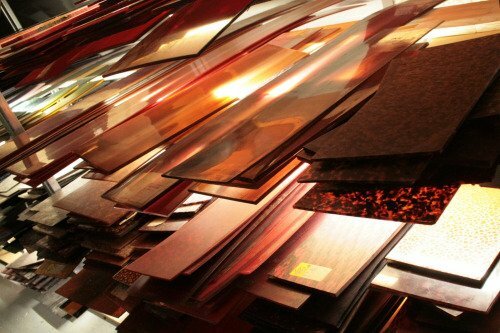 Don’t just pick a piece of acetate. Pick from glasses that are already made up - and then at the most, consider other colours with the same pattern. I've made that mistake before, and it felt like a real waste. With my bespoke glasses from General Eyewear, pictured above, I'd learned my lesson. I went to General Eyewear’s studio in Camden, and spent a good while browsing through their huge archive of styles - looking for inspiration both in terms of design and colour. My idea (again, very conservative following previous mistakes) was to start from the basic, classic panto shape I love (I brought my normal pair with me) and vary it slightly. So from the archive we found a slightly chopped-off panto frame, which I liked; a nose shape without any ‘keyhole’ section to it; and a third with slightly rounded arms. These three were then combined into the style you can see here. But the biggest change was the colour of the acetate. I started off assuming I would merely go for a lighter-brown version of what I already had. But looking through the General Eyewear collection (all made up with acetates they had in stock) brought up lots of other ideas for colours. In the end I went for the more grassy-yellow, more mottled shade. I never would have picked it from an acetate plate; but seeing it made up gave me the confidence to pick it - and I’d very glad we did. The final glasses need some work in terms of fit. The arm length is perfect, but they are a little too tight at the back and the nose pads need some adjustment. 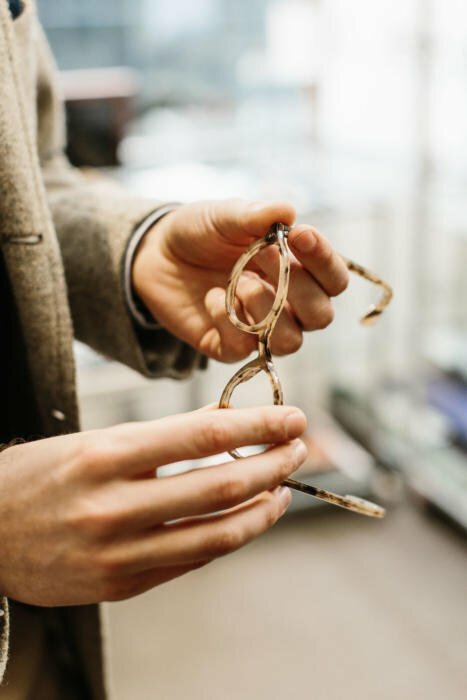 Fortunately, these are things General Eyewear can fix, given the material is acetate (a moldable plastic) rather than horn or anything more precious. The bespoke frames cost £450. They were entirely handmade in the UK. Once a first bespoke frame has been made, General Eyewear can make subsequent pairs in the same design (with small tweaks or different materials) for £350. 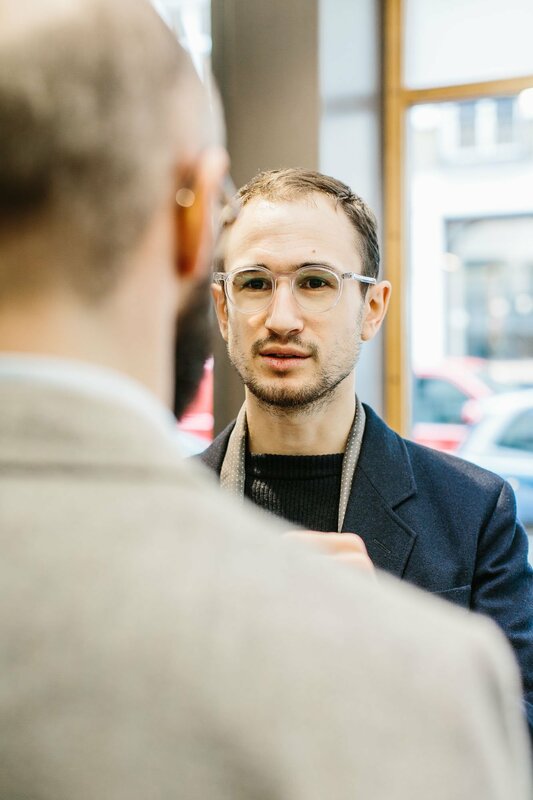 For more on General Eyewear, see my post on them during our pop-up shop here. 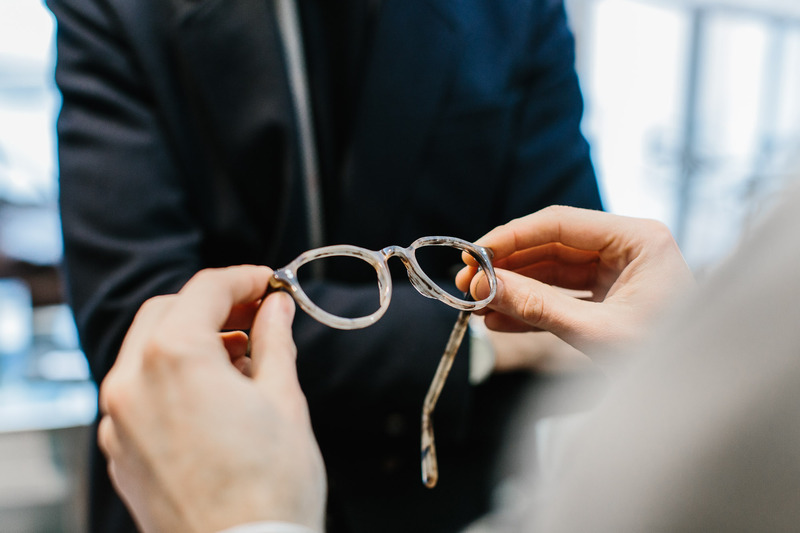 Taken during our pop-up shop on Savile Row last month, where General Eyewear featured. 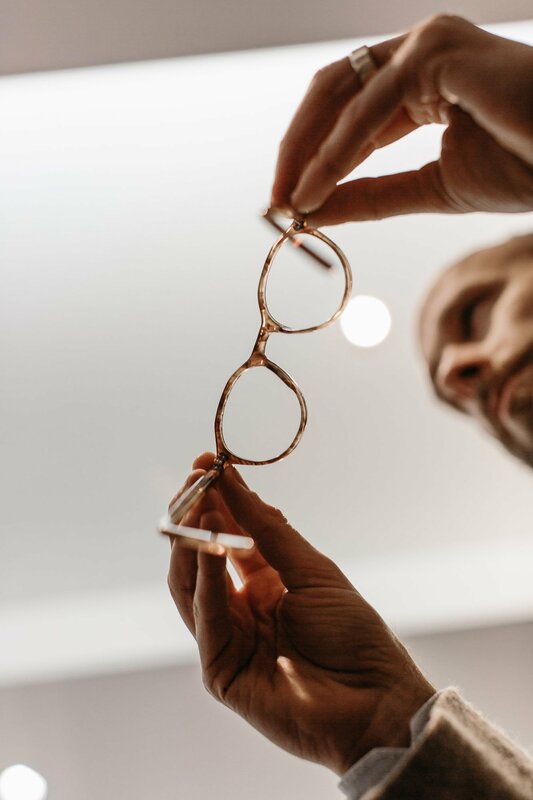 You can follow the discussion on Designing bespoke glasses – General Eyewear, London by entering your email address in the box below. You will then receive an email every time a new comment is added. These will also contain a link to a page where you can stop the alerts, and remove all of your related data from the site. By way of comparison to the other makers you have tried, what’s the quality of construction like? Would it be worth the premium to go to Meryowiz? The repeat price is especially attractive. Does that price also include having prescription lenses made and fitted or is it just the frame? Someone of the initial post commented that the cost of lenses for the glasses are fairly inexpensive from here. What’s the additional cost? And would you recommend having the lenses made here. I would – and see comment above on the price. Just checking. Off the back of Simon’s initial introduction to General Eyewear as part of the PS pop-up shop I took my girlfriend to the Camden showroom to design a pair of frames for her as she’s a daily glasses-wearer. In the process of looking at archive frames she picked out a nice pair which were too big in the bridge and, for her tastes, a bit long in terms of lens height. However, the staff (who were all very helpful and instantly spotted me as a PS reader!) said that as these were relatively straightforward adjustments to an archive frame it would cost £350 rather than the true bespoke price of £450. This feels more akin to made to measure but given how many different frames are on site it feels to me to be closer to the bespoke end of the MTM spectrum. The designer has sent through a number of iterations and permutations: original archive, archive with bridge adjusted, archive with bridge and lens height adjusted, etc. And of course all rendered in a variety of different acetates (the picking of which was by far my girlfriend’s favourite part of the experience). We’re eagerly awaiting the finished pair (turnaround time is 4-6 weeks) but I wanted to make everyone aware that even though the £450 option is still great value for the quality there is an even cheaper option for those that are happy to be guided by one of the thousands of beautiful frames they have in the showroom. I too went to their Camden showroom after catching their vibe at your pop-up. I ordered a bespoke pair–something similar to but not quite what Malcolm Forbes wore (U.S. publisher). In describing my bespoke preference (and showing images) the gentleman pulled a bunch of similar samples from their vintage archive, which itself is incredible and worth seeing–truly. After photographs and measurements I went back and forth with the designer a few times to complete the look I am after. Frames should come in early May and I’m excited. I love the idea of having something truly unique and believe the proposition to be a good value. Thank you Simon for the introduction(s); at this point there have been so many. What’s the Cifonelli cardi like Simon? Especially with the silk blended in? Having a rather narrow nose it is difficult for me to find rtw frames with a bridge that is not too wide. One seller suggested the acetate could be narrowed while another was skeptical. So I wanted to ask if you would recommend it? Probably not. It’s hard to add, much easier to take away. How high is the quality of the design? 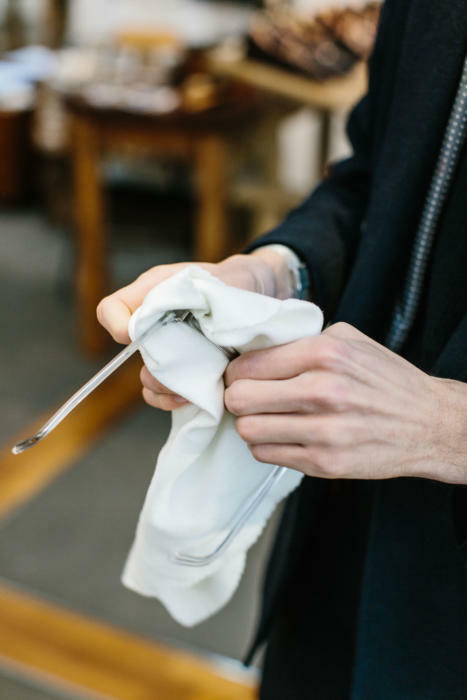 I tend for brands like Oliver people’s that are good enough quality and who have really nailed an aesthetic… Will the staff there knowledgabley guide you? Absolutely, they’re very knowledgeable. And there’s a specific aesthetic to their in-house collections as well, on top of the availability of all the vintage to browse. A late comment but i would like to add a note about bespoke glasses in horn. Having had such glasses made by Meyrowitz i would not recommend this to anyone unless, they owned several pairs of glasses and, are happy to depart with their money.This shop is for those with plenty of money. Firstly, horn frames are very expensive to buy and, you wait a long time for them to be made. I decided to go down this route because i wanted just one pair (a big mistake) that i would own for, well nearly the rest of my life! This would be ‘my look’. As it turned out after 3 unsuccessful attempts at getting my prescription lenses right i had to go to Opera Opera to have that done and fitted in the frames. The problem then was that if Opera Opera broke the horn frames whilst fitting the lenses they would not be liable – which i understand. I now find that horn tends to expand easily (i take mine on and off all day) so, you need quite regular adjustments to them. Again no other opticians will do it (they require steam and not heat to bend them) and so, you are left with this separate issue to deal with. I eventually decided to go back to Meyrowitz to have them adjusted. In short they did fiddle with them on the spot but were not keen as all they wanted to do was to sell me a re-polishing of the horn (mine have gone rather mat) and a service whereby they tighten the screws etc. An overhaul basically that would take 2-3 weeks. At a price of something around £375 if i remember rightly, i fled from the shop never to return and vowed never to own horn again. 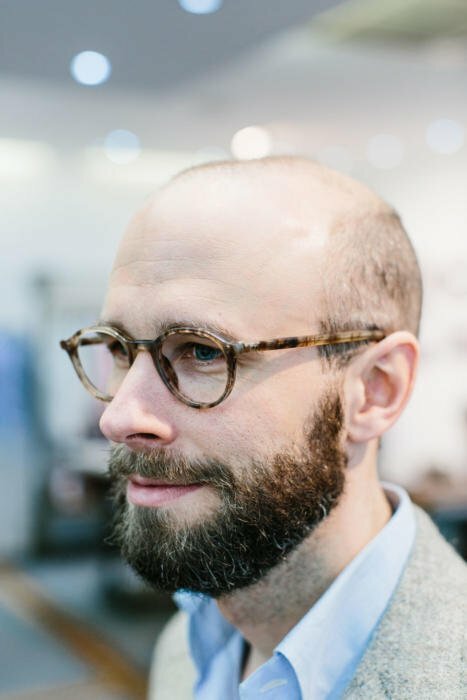 Simon – I am looking to order a pair of bespoke sunglasses, and am debating between General Eyewear and Cubitts. Both appear similarly priced (450 GBP), but curious to get your thoughts as it appears you’ve tried both makers in the recent past. Yes I have. Both are good, and it’s hard to separate them. If anything, I would say that I would be inclined to go to Cubitts if I liked some of their ready-made styles and wanted to tweak them for fit, colour, small styling points etc. And I would be more likely to go to General Eyewear if I wanted something more unusual and adventurous.